Mikhail Glinka wrote his five-act opera Ruslan and Lyudmila (Руслан и Людмила, Ruslan i Lyudmila) between 1837 and 1842, based on a poem of the same name published by Alexander Psuhkin in 1820. The libretto to Glinka's opera was written by Valerian Shirkov, Nestor Kukolnik and N. A. Markevich, among others. It was premiered in 1842 in Saint Petersburg. 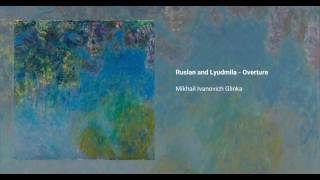 As with his other popular opera A Life for the Tsar, Glinka's Ruslan features prominent folkloric elements, as well as numerous eastern influences (it is one of the first recorded uses of the whole tone scale in Russian music). The Overture for Ruslan has become a concert staple and it is regularly performed.